The Pickle Pounders relished a big victory as they took top honors in the SummerGlen Pickleball Club Fun Days Tournament three-day series that wrapped up Thursday night. "It's amazing everyone stayed, even with the rain delays," said team member Mike Field, as things wound down in the 84-game series. 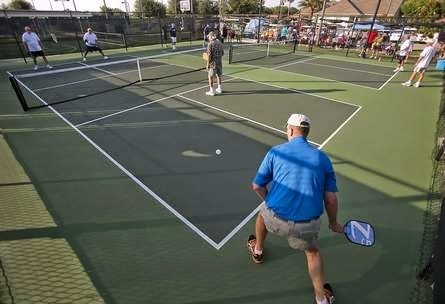 Pickleball is gaining popularity at the SummerGlen community south of Ocala, just as it has been sweeping the nation, according to the USA Pickleball Association, which is based in Surprise, Arizona. Ruth Rosenquist, in media relations with the association, said the name of the game is possibly either for the founder's ball-retrieving dog named Pickles or a type of boat popular in Washington state, where the game started.